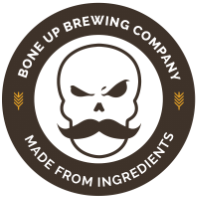 Stats: Four Star Smoothie - Bone Up Brewing Co.
Best Occasion to Drink: While planning adventures. Brewers' Notes: When our friends over at Four Star Farms (who happen to be our main hop supplier) tossed out the idea of swingin' through to brew a beer with us featuring one of their newish hop blends, we jumped at the chance so fast that we might have fallen down a little in the process. Anyway, we got a couple big ol' bags of CrysCade and threw them in this big ol' beer and now it's tasty times!